The first round starts off at a nice slow pace to help you get used to the controls. You will mostly encounter Gunmen and a few Snipers until you get further into the level. The first two barrels that you encounter (both on your right) have speed-up boots, and they will help you move around the screen more quickly. At the end of the long row of buildings on the right, Bombers will begin to appear. Beginners should be careful around the well, as it is easy to be caught off guard by the gunmen who appear from the side while you are shooting barrels. In addition to more Snipers, Gunmen will jump off the balcony to the ground below, to attack you. The second barrel on the left side has a rifle power-up which you should collect in order to shoot farther. When you see three barrels in a row on the left, three Riflemen will appear. The three barrels have 1000 point bonus items. After the second well, two barrels will appear on the right. The second one will have a horse. Collect it as quickly as you can for added protection. Then carefully make your way around the pond. The first Back-stabbers appear just before the boss as they jump off the balcony. Health: 4 bars. As the first boss, Master's behavior is very simple. He will walk around, shooting at you until he gets shot. His bullets are fairly thin, and he only shoots them at a fixed angle similar to the angles of Billy's bullets. It is quite easy to stand just to the side of his bullets' trajectory and fire at him while he cannot hit you back. After he loses a bar of life, he will crawl around on the floor shooting at you until he feels brave enough to stand up again. While he is on the floor, he is invulnerable to your shots, so focus on shooting at the surrounding enemies while you avoid Master's bullets. When he stands back up, focus your attention on him until he falls back down again or dies. The barrel to the left contains a POW that will knock out every enemy except the boss. Try to save it for when you need it most. After a train rolls past you on the left, you will start off facing Gunmen. You will find a pair of boots and a rifle among the first four barrels on the right. Watch out for the Back-stabbers that appear from between the buildings. 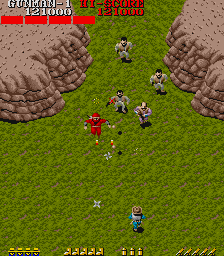 You will then face a full variety of enemies through the remainder of this section. The last barrel on the building before the stretch of open land contains a horse which you should definitely attempt to safely collect. During the open stretch, avoid the temptation to run up to the top to meet enemies, as many Gunmen will get behind you if you do. 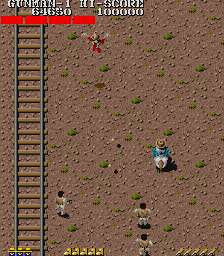 As you pass the parked train on the left, you will have to watch out for the purple Gunmen who remain on top of the train and shoot down at you, while you deal with gray Gunmen appearing from the top and the right. A group of Bombers will attack you as you walk pass the engine of the train, and more enemies will attack you even as the screen stops scrolling and you wait for the boss to appear. Health: 4 bars. Roy attacks by throwing a pair of knives at you (of which he has an unlimited supply). He will throw his knives straight towards Billy's current position, so it is a good idea to keep moving once he starts throwing them. If your aim is very good (or if you get very lucky), you can actually shoot Roy's knives down before they reach you. Roy is a bit of a jumper, and likes to leap around in order to avoid getting shot. Don't be tempted to follow Roy when he leaps up to the top of the screen. Instead, patiently deal with the enemies that are within your range and wait for Roy to come back down to you. You may have an easier time hitting him from the side than straight on. The primary feature of this stage is the many obstacles and bodies of water that you must weave your way around. Bridges connect the land on opposite sides of the screen, but they can make for particularly dangerous passage since you can't actually shoot to your side. Shoot across the bridge while you're still in front of it to clear it of enemies before you attempt to cross. One interesting aspect of this game is that you will not die if you get trapped between an impassible object and the bottom of the screen; you will merely scoot to the nearest available empty space. The first barrel on the right contains the first instance of the bullet upgrade, which speeds up your shots. 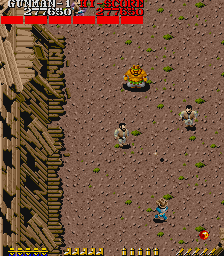 After that, it is extremely important that you focus on shooting the enemies and not get distracted by the barrels. However, the next barrel after a bridge on the left contains a horse which you should attempt to collect. Then you will find a collection of barrels on the right side, leading up to a bridge. The last two contain boots and a rifle. Then remain on the left side of the screen until you begin to see the first bull. Shoot the bull from the side to make it run away, and shoot the barrel behind it to obtain a POW and knock out the enemies. When you see two barrels, one behind the other in front of a root, the second one contains a 20,000 point cow. Keep shooting the enemies that are around you, but don't ignore the enemies that appear on the opposite side of the river. As you approach the end of the stage, two of the last three barrels on the opposite bank have bonus point bags. Then the stage will open up to a clearing before the boss appears. Health: 4 bars. Although Ninja behaves similarly to Roy, he is considerably harder to hit. He attacks by throwing two shuriken, one at a time, directly at Billy's current position. He only performs his attack in mid-air while he performs a long, slow leap to the side, so when he jumps like this, keep moving to avoid his projectiles. Like Roy's knives, they can be shot down, but due to their speed, this is considerably harder to do. Ninja normally performs smaller jumps and backflips, and can only be hit while he's standing on the ground. But he leaps so continuously that it can be difficult to predict the moment when he will stop and be vulnerable to your fire. When he takes enough damage to lose a health bar, he teleports away in a puff of smoke and reappears near the top of the screen. He is a bit easier to hit from the side than straight on, and you will also have the usual assortment of enemies to deal with while you try to take Ninja down. Health: 5 bars. Cutter may have more health than the previous bosses, but he's a bit easier to take down because he tends to stand still and remain vulnerable for longer periods of time than previous bosses. He moves around in small, slow hops, and it's easy to see where he will land each time. Cutter attacks by throwing a pair of boomerangs simultaneously, each in opposite directions towards the bottom corners of the screen. Once they reach the bottom corners, the boomerangs will turn sideways and fly towards each other, trying to hit Billy who is likely hiding in the middle between them. The boomerangs slightly home in towards Billy after they turn around, but only slightly and he can easily move out of their way by running upwards. The boomerangs can be shot down by your bullets. Cutter also stands motionless for a long time before throwing his boomerangs, and his attack can be cancelled if he loses a life bar during this time. 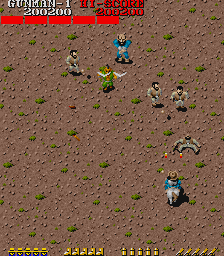 It is quite possible to prevent him from ever attacking, assuming the random regular enemies don't get in the way. However, due to his small hops, he does not travel around much towards the bottom of the screen, and you will probably have to advance towards him often, so be careful not to allow the regular enemies to get behind you. A lone Gunman will appear by the time you are able to shoot the first two barrels on the bridge (the right barrel contains boots). After that, enemies will begin to pour in from above and the left. Three Gunmen will jump down off the roof of the first building. 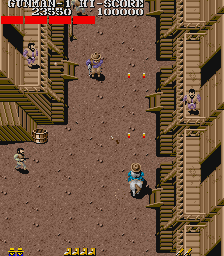 In the three barrels to the left, you can find a rifle and bullets power-up. As you continue past the buildings, it's easy to get forced to the right in order to avoid the Snipers in the windows. Don't let them do that, try to stay to the left as long as you can by shooting into the windows. When the buildings on the left stop, there will be a short break in the action. You will then pass through a long stretch along the river, with many bridges and a few barrels. Some barrels have power-ups but don't put your life at risk just to find them. When buildings reappear on the left, you will only find two 1000 bonus point bottles among the four barrels. However, the next three barrels on the left each contain a different power-up while the next two on the left also contain two 1000 bonus point items. The buildings will switch to the left side where many snipers will take high positions in the windows. Do your best to clear all of them before the boss appears. Of note, this is the only stage without a horse power-up. Health: 6 bars. Pig Joe has even more health than Cutter, and he's much harder to wear down, so be prepared for a long fight. Pig Joe hops around quite a bit, and like other bosses, he's only vulnerable when his feet are touching the ground. However, he doesn't hop far, so it's a little easier to anticipate where he will end up. He has two attacks. The first attack is just like the Bombers, where he stays on the ground and throws several sticks of dynamite slightly in front of him. These are easy enough to avoid, simply don't walk too close to them, and he's easy to hit at this time since your bullets have more range than his throwing arm. However, Joe's second attack is considerably more dangerous as he, without any obvious warning animation, hurls a fast fireball straight to your location. The only way to assuredly avoid getting hit by this attack is to move continuously. This attack almost always comes out just as he's about to land from a jump, so do not stand still shooting at him while he lands. For an easy way to defeat him, after each time he loses a life bar, he recoils backwards, and then immediately performs a small jump forward. He never shoots a fireball during this jump, and can be shot when he lands, and will recoil again and repeat this behavior. If regular enemies do not interrupt you, he can be locked into this cycle until he dies. This page was last edited on 9 January 2016, at 10:14.